- At an altitude of 190 meters (625 feet) above sea level in the countryside of Terlizzi (Italy) our Premium Quality Extra Virgin Olive Oil is produced from PDO olive with the highest standard to give its distinctive taste of Apulia countryside. All of our olive trees are cultivated using the most ancient traditional techniques. 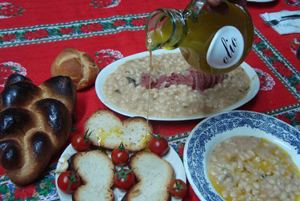 The harvesting of the olives is carefully timed to gain its maximum flavour and unique characteristics of the "Coratina" olives. Coratina olive is a variety grown only from traditional farmers and from those who do not want to compromise quality with quantity. This olive variety produces a consistent and fragrant Extra Virgin Olive Oil of golden/green colour and at the same time, more importantly, the oil achieves very low acidity levels. The olives from our land are picked and on the very same day, they are transported for two miles to be screened from leaves and any other impurities like soil and little stones and cold pressed into our finest Extra Virgin Olive Oil . This has been the most exceptional year we have ever experienced. Indeed, on the 28 February 2018, most of our lands have been affected by a very unusual frost which froze all emerging new growth of the trees. We have our name on it! - To read a brief introduction to our unrefined (Grezzo) Italian Extra Virgin Olive Oil DOP. Click here for more info. 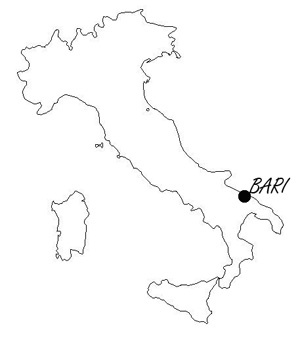 - All our lands are located in the countryside of Puglia in the south of Italy near Bari province. Here, the Coratina olive trees find the perfect conditions to deliver the most tasteful Italian Premium Quality Extra Virgin Olive Oil. This award is given from a combination of natural environmental factor like the stony soil, the sunny and hot summer and the optimum altitude from the sea level. - The origins of the cultivation of olives were found in the Middle East, and then it developed throughout the Mediterranean basin. In Syria and Palestine, mills have been found dating back to 5000 BC. In Italy, more precisely in areas around Torre a Mare (Bari) and Fasano (Brindisi) geologists found artefacts dated back to the same period confirming as in that period olives were part of the local gastronomy. Click here to view and purchase our products. Do you think cheap olive oil is a deal? Think again! Just type in Google “ fraud extra virgin olive oil ” and you will be overwhelmed of the amount of scams reported by the newspapers. Click here to read few articles which reported major scams of olive oil around the world. Be aware!